The mainstream pretends it’s no big deal. Hey there little buddy wear these plastic lenses, pretend we’re still living in the medical stone age. These glasses will fix you right up, son. Realistically though you are entirely helpless if you loose those glasses or contact lenses. Just think about it. How far can you make it on your own, without 5 and more diopters? Can you make out the number on the bus? Read a street name? Of course not. You can’t drive, ride, or even safely walk anywhere busy and crowded. -5 diopters is like being in a wheelchair. But -3.25 diopters, two diopters less? That’s a whole different story. You can just about find your glasses even if you forget where you put them down. It won’t be fun, it will be squinty, but you can pull it off. With two more diopters you weren’t able to tell if you’re looking at a house cat or your sneakers. Glasses? Forget finding those. At -3.25 you’re still not readily going to find your way home, but at least you have a shot. 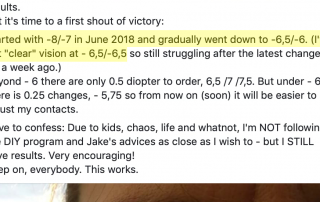 He’s so close to -2 diopters, another huge milestone. And maybe you’re thinking, Jake, we get it. 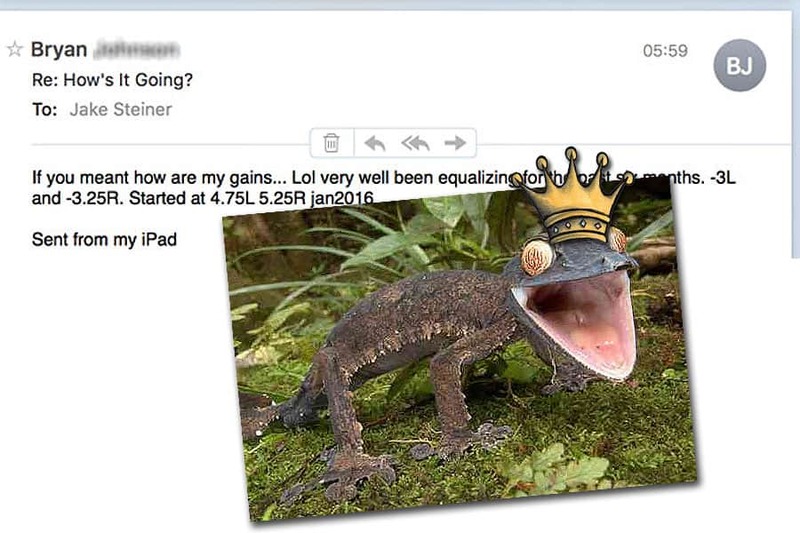 You posted four billion progress reports. People make 20/20 gains. You can stop anytime now, Jakey. But we’ll never stop posting these. 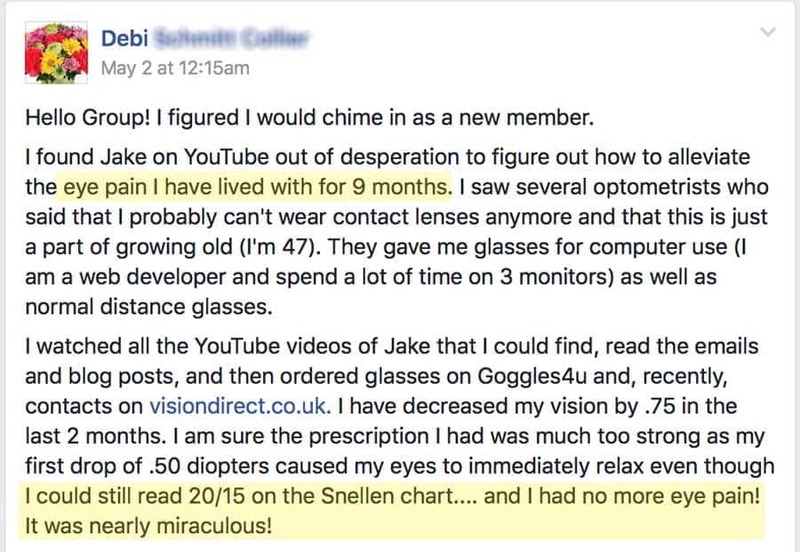 I want one for every optometrist saying ‘it can’t be done’, one for every Internet troll face saying ‘Jake you’re just a big scam out to make money’ (which of course is actually true), one for every person out there wondering how their eyes got so far off track. A million voices, a million diopters, all saying: Yes we can get our eyes back. So dramatic there Martin Luther Jake, you’re thinking. It matters, though. I too used to be a -5 diopter blind rodent. And right now today I’m sitting in some Saigon coffee shop, eyeballing wind forecasts for the Vietnamese coast. Thinking about where to go kitesurfing next week. This is stuff I wouldn’t ever even have thought about, when I needed that huge correction just to even function walking around a city. I could have easily lived my whole life as prisoner behind those stupid plastic lenses. And if you’re here reading all I want is for you to have meaningful grounds to question whether the mainstream myopia tale makes any logical sense. That’s all. 20/20 gains. Make some.